Cardiff missed the chance to move level with second-placed Derby as Millwall battled to a point on the night veteran Tim Cahill made his second Lions debut. Junior Hoilett drilled in the opener after Mahlon Romeo was caught in possession, as Millwall began sloppily. But the hosts fought back in the first half and were rewarded when Lee Gregory turned in Jed Wallace's cross. The Londoners edged a scrappy second half but were kept out by keeper Neil Etheridge, as Cardiff stayed fourth. 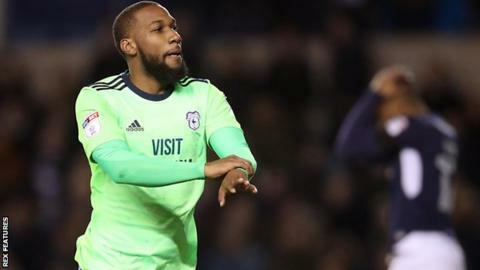 However, Bluebirds boss Neil Warnock criticised referee Keith Stroud for denying the visitors victory by ruling out a strike by Sol Bamba on 83 minutes. The centre-back acrobatically smashed home the ball from close range, but Stroud had blown his whistle moments before to give Cardiff a free-kick for a robust challenge by Steve Morison on Joe Bennett on the edge of the area. Earlier Etheridge had made two smart saves, palming a shot from Ben Marshall behind and scrambling down to his left to stop a deflected effort from Wallace. Australia international Cahill came off the bench in second-half stoppage time, but the veteran forward was unable to make an impact in his first appearance for Millwall since the 2004 FA Cup final. "We probably got away with one with the goal that was disallowed. I feel for Cardiff in some sense because they are probably on the wrong end of a decision. "We had a very similar one at Brentford where we scored a good goal and it was pulled back, so that probably evens that one up for the season. "I'm really pleased with a point as it was a poor opening 20 minutes by us and a poor 15 minutes to finish. "We showed real quality up to half-time but didn't build on that momentum in the second half, and that is credit to Cardiff." "I think it is appalling at this level. Sol is going to shoot and then he blows. "I don't accept that. He is a really experienced referee and I feel let down. He cost us the game. "We are fighting to get in the Premier League. But for the referee it would have been three points." Match ends, Millwall 1, Cardiff City 1. Second Half ends, Millwall 1, Cardiff City 1. Attempt missed. Callum Paterson (Cardiff City) left footed shot from the left side of the box is close, but misses to the left. Substitution, Millwall. Tim Cahill replaces Lee Gregory. Corner, Cardiff City. Conceded by Jed Wallace. Attempt blocked. Callum Paterson (Cardiff City) header from the centre of the box is blocked. Assisted by Sean Morrison with a headed pass. Corner, Cardiff City. Conceded by George Saville. Attempt missed. Callum Paterson (Cardiff City) header from the centre of the box is too high following a set piece situation. Loïc Damour (Cardiff City) wins a free kick on the right wing. Substitution, Cardiff City. Loïc Damour replaces Nathaniel Mendez-Laing. Marko Grujic (Cardiff City) wins a free kick in the defensive half. Corner, Millwall. Conceded by Nathaniel Mendez-Laing. Attempt blocked. Gary Madine (Cardiff City) header from the centre of the box is blocked. Assisted by Joe Ralls.